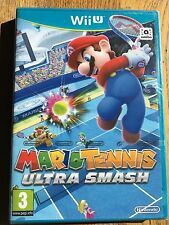 Mario Tennis Ultra Smash - Wii U Nintendo UK Release Factory Sealed! Nintendo Factory Sealed with tear strip. Flawless condition. Official UK Release. 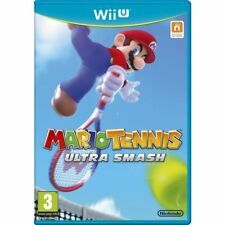 5 out of 5 stars - Mario Tennis Ultra Smash - Wii U Nintendo UK Release Factory Sealed! 6 product ratings6 product ratings - Mario Tennis Ultra Smash - Wii U Nintendo UK Release Factory Sealed! Mario Tennis Ultra Smash Nintendo Wii U 3 Years. Condition is Very Good. Dispatched with Royal Mail Disk only. mario tennis ultra smash, nintendo wii u. Condition is Very Good. Dispatched with Royal Mail 1st Class Large Letter. Lost, broken or damaged your Mario Tennis game box? Buy an Official PAL / UK nintendo switch game box replacement. (No game cart) in great condition. All boxes are the official case and artwork. Delivered in bubblewrap packaging. Nintendo Mario Tennis Ultra Smash Wii U game UK 2015. Condition is Very Good. Dispatched with Royal Mail 2nd Class Large Letter. Mario Tennis Aces for the Nintendo Switch in great condition. Gold points have been redeemed. Mario Tennis Aces (Switch) Game Nintendo Switch. Condition is Very Good. Dispatched with Royal Mail Signed For® 1st Class Letter. Tested PAL version with manual and story insert. All the games boot up fine. From a smoke free home. The games are: Mario power Tennis Wall E Narnia Prince Caspian Indiana Jones and the Staff of Kings My Word Coach I reset all the saves. 5 Nintendo wii game bundle all great condition with booklets. Condition is Like New. Dispatched with Royal Mail 2nd Class. 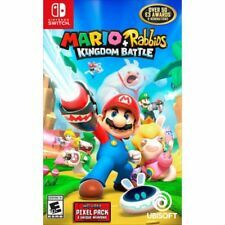 ***Mario Aces Tennis Nintendo Switch Game Card Only***. Condition is Like New. Dispatched with Royal Mail Signed For® 1st Class Letter. USED IN EXCELLENT CONDITION Mario Tennis Aces (Nintendo Switch). Condition is Like New. Dispatched with Royal Mail Signed For® 1st Class Large Letter. Mario Tennis Aces - Nintendo Switch - Cart Only - Hasnt been used (NO CASE). Condition is Like New. Dispatched with Royal Mail 2nd Class Letter. Mario Tennis Aces (Switch) BRAND NEW AND SEALED . Condition is New. Dispatched with Royal Mail 2nd Class Large Letter. "Mario Tennis Aces". Nintendo Switch Mario Tennis Aces. Nintendo Switch. (Compatible With Nintendo Switch Only). Attack:Use Zone shots to break the opponent's racket. New Sealed in the uk ready for dispatch. You are purchasing Mario Tennis for the Nintendo 64. that I have tried to show in the photograph. There is also a minor crease on the side of the box under the word Tennis. Mario Tennis Ultra Smash. Original Version. Mario Tennis: Ultra Smash (Wii U). New characters make their Mario Tennis debut. Play against friends and family in both singles (1v1) and doubles (2v2) matches as your favorite Mushroom Kingdom character. Where else could you play tennis on a court surrounded by lava?. Play solo or with up to three friends simultaneously. There is also a Ring Shot Mode, a tennis variant that has players trying to send balls through as many golden rings as they can. Mario Tennis: Ultra Smash WiiU. Outwit your rivals and challenge friends to singles and doubles matches as your favorite Mushroom Kingdom character! Mario Tennis: Ultra Smash. Get assistance at any point. 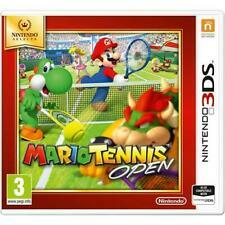 MARIO TENNIS OPEN - NINTENDO 3DS & 2DS - 'NEW & SEALED'. Play online against players in your region or set up a group with your friends. 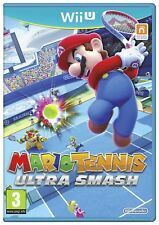 MARIO TENNIS ULTRA SMASH ** NEW & SEALED ** Nintendo Wii U Game. Condition is New. Dispatched with Royal Mail 1st Class Large Letter. You can train up the perfect doubles partner with amiibo! Mario Tennis : Ultra Smash. Up to four players can compete in tennis matches that could only take place in the Mushroom Kingdom. With the addition of Jump Shots to hit high balls overhead, or Giant Mushrooms that when picked up make characters bigger, this Mario Tennis is reborn with features enabling players to aggressively go after higher balls. We are a team of nine based in a 2,500 sq/ft unit in a gated industrial park in South Manchester, UK. Product Summary. Used - Like New. Item Condition. Master System. You'll need to achieve certain goals to do so, however, and that's no small feat. The more experience you gain through winning matches, the more skills and abilities your character will possess as attributes. As per photographs all in very good condition. Up to four players can compete in tennis matches. pre-order released 20/11/15. Mario Tennis: Ultra Smash (Wii U) (New). Nintendo MARIO TENNIS ULTRA SMASH 2326646 NINTENDO. Up to four players can compete in tennis matches. A GREAT COLLECTION FOR ANY N64 OWNER. A REAL NICE AND NOW BECOMING VERY RARE ITEM. Compete with up to 4 friends in Mario Tennis Ultra Smash for the Wii U.
Nintendo 64 N64 PAL. 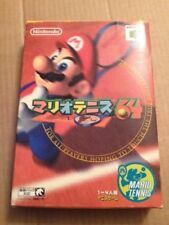 Mario Tennis - GOOD CONDITION. Instruction Manual. Cleaned & Tested - In Full Working Order. Bookmark Us.